DON'T JUDGE ME IT'S CHEAT DAY! We all know the joys of our "CHEAT DAY" or even a "Cheat Meal"!! After all, you put in the work, you deserve the reward, right?! But, sometimes those cheat meals/days get ridiculous and sometimes people look at you like you're crazy! Years ago we used to joke about people judging us on cheat day & then the concept was born “Don’t Judge Me Iit’s Cheat Day”. 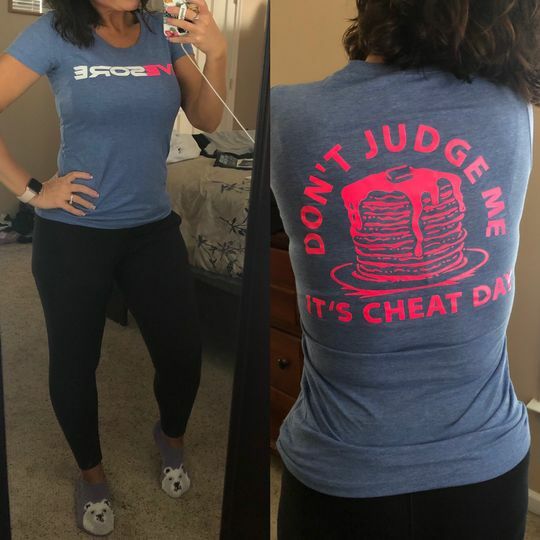 This high quality shirt is slim fitting and will show off your pride in your cheat day while getting plenty of smiles from those who see it! Love this shirt! I get lots of “where did you get that from” or “I need that shirt”.